Works to open up Whitby Park perimeter is complete. 15th April 2016 – Work to open up views into the ‘hidden treasure’ of Whitby Park from Stanney Lane in Ellesmere Port is now complete. The work was carried out by Cheshire West and Chester Council’s Town Centre Improvement team as part of a scheme to improve the approach to Ellesmere Port town. The landscaping works were part of a programme of town centre improvements funded through a special budget ring fenced for the town centre of Ellesmere Port. 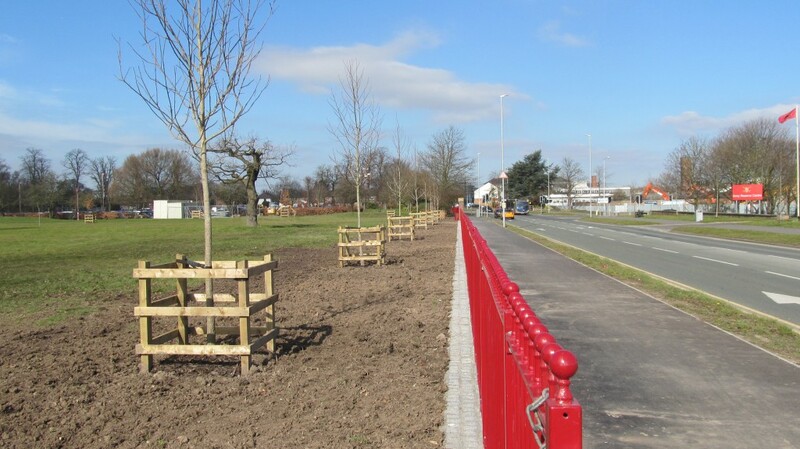 Works consisted of removal of a stretch of existing perimeter hedgerow, removal of old railings and replacing them in the style of railings near the park entrance, installation of new railings, replacing hedgerow to the front and side of the park and planting new trees, including liquid amber trees in symmetry with those in front of the Army Reserve Centre, as part of the Stanney Lane Boulevard. This work is part of ongoing investments in the park and follows a new community café in Whitby Hall, path widening in front of the park, installation of free running Parkour, and pond clean up.